An ongoing discussion about restarting Rooivalk production includes an option to design a new platform based on technology developed for South Africa’s indigenous attack helicopter, says Denel Group chief executive Riaz Saloojee. Last March, South African defence minister Nosiviwe Mapisa-Nqakula publicly expressed interest in restarting a Rooivalk production line that has gone dormant since 2007 after delivering only 12 aircraft, but offered no details on timing or funding. Those discussions between the Ministry of Defence and Denel Group are ongoing, Saloojee says. The talks have also broadened to consider additional options, including development of a new aircraft. Asked if Denel would restart production of the Block 1F standard of the Rooivalk that entered service in 2011, Saloojee instead described the ongoing talks as taking a broader view. Saloojee declined to define a minimum number of orders that would be required to justify relaunching Rooivalk production or starting a new development programme. “We are in analysis phase at the moment. We are looking at the feasibility not only from a manufacturing perspective but also a market perspective – what is the investment that is going to be required over what period. So all of those decisions need to be considered before a decision is taken,” he says. The Rooivalk was launched in 1984 by a predecessor company of Denel called Atlas Aircraft Corporation during the apartheid era, when sanctions limited the country’s access to weapons systems. 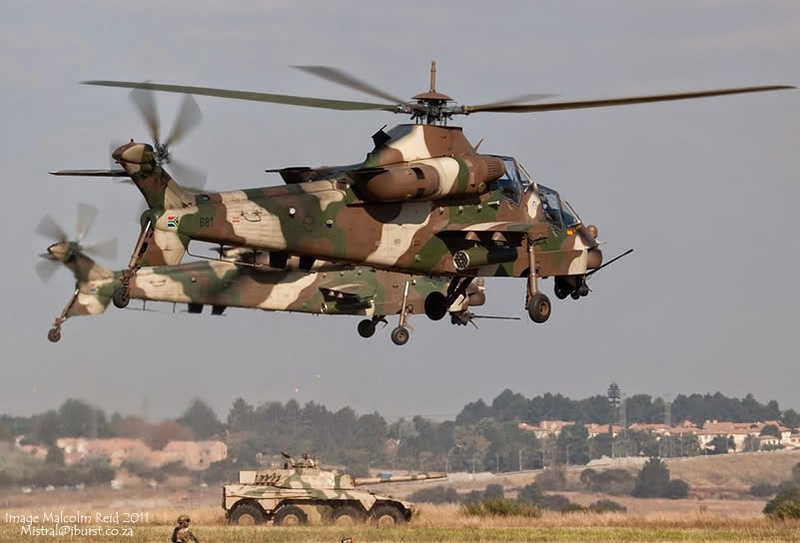 It leaned heavily on the engine and dynamic components designed for South Africa’s Oryx helicopter, which includes elements of the Puma and Super Puma aircraft. The Rooivalk programme, however, was delayed as South Africa shifted suddenly into the post-apartheid era 10 years later. The aircraft finally entered service in 2011 with weapon system and gearbox upgrades developed to meet the Block 1F standard. The aircraft was deployed in a combat situation for the first time in 2013. A South African unit assigned to a United Nations peacekeeping force deployed the Rooivalk against artillery positions of the March 23 Movement, a rebel army in the Democratic Republic of the Congo that had shelled civilians.